This item will be fulfilled from the vendor. Delivery time varies – typically 2–3 weeks. Restrictions: This item does not ship to a PO Box, APO, FPO, DPO or international address. Expedited shipping is not available. West Marine will email you when your order ships from the vendor. This item will be fulfilled from the vendor. 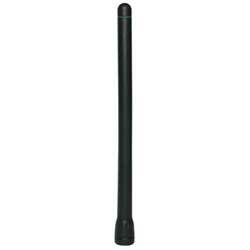 Soft, flexible replacement antenna. Same as supplied. The West Advisor articles have answered boaters' questions and provided solutions to boating problems for more than 20 years. West Marine has compiled one of the Web's most comprehensive collections of technical boating information articles. Available for ALL products including hazardous & truck freight items. Ship to over 240 U.S. store locations. Contiguous United States orders arrive in 7 - 10 days. Hawaii and Alaska orders arrive in 10 - 16 days. Expedited shipping is available for an additional fee. Applicable on orders over $49.00 within the 48 contiguous United States. Does not apply to Truck Freight. Orders will be delivered within 3 - 7 business days. We stand behind everything we sell. If at any time your West Marine purchase does not meet your expectations, you can return it for a replacement or refund. If you are a West Advantage Rewards member, you don't even need a receipt - we'll have a record of your purchase. Returns can be made via mail or in person at their nearest store location. If you are not a West Advantage Rewards member, we will first need to verify your purchase by receipt or other method. We do carry a few items that cannot be returned. This includes: items with expiration dates that have expired such as flares, charts, annual publications; items registered to the user such as boats, motors, EPIRBs, PLBs, SPOT, Class B AIS, life rafts; customized items such as rigging, and boat covers, computer software and electronics charts. Other non-returnable items include carry-on air conditioners, generators and select electronics. We will help you contact the vendor for assistance or repair on product that cannot be returned to West Marine. Items containing hazardous material may only be returned to a West Marine store. For additional inquiries, you may call Customer Service at 1-800-BOATING (262-8464).